There is a word that is hated by many. Politicians hate using the word, though reluctantly they usually have to; the rich, middle class and poor equally detest it; companies balk at it and cry for mercy. The word I am talking about is TAX. 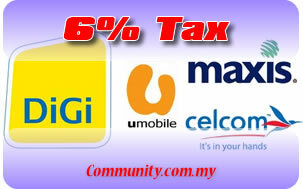 Yes, I am talking about the recent hoo-hah over the 6% prepaid tax that telcos want to pass on to consumers. There have been countless allegations, as well as extremely flawed and fundamentally wrong arguments coming from both sides of the political divide. Even more appalling is that some of them come from our Finance Minister. This is one of the greatest myths in economics: that if we tax corporations, and they absorb it, we do not have to pay for it. Let me ask you a simple question. Who pays taxes? The floor? The company table? People pay taxes. Taxes are basically an extra cost. Let’s say I make a packet of nasi lemak for RM 1. My cost of making one packet is RM 0. 50. Therefore I earn RM 0.50. What happens if the government says I have to fork out 10% in taxes. So that means now, I have to pay a tax of RM 0.10 (10% of RM 1). This means my profit has reduced from RM 0.50 to RM 0.40. My next question to you is what does a mak cik selling nasi lemak do when her profit is reduced? She can do two things: raise the price, or try to reduce the cost. In the case of reducing cost, it would means either using cheaper ingredients, or hiring less workers. In any case, someone else suffers along with the nasi lemak mak cik: people – us. The telco situation is exactly the same. By asking the telcos to absorb the tax (i.e. not allowing a raise in price), and telcos being profit-oriented companies whose ultimate goal is to maximise their profits, they will do one of three things: (i) they will have less dividends to pay out to investors, who poured their hard earned money in the enterprise; or (ii) they will reduce their workforce, depriving of people like you and me of jobs; or (iii) they will cut down on the quality/ maintenance/ bonuses that their customers receive, resulting in worse service for everybody; or they will try to raise prices in indirect ways such as a higher registration fee, and some other type of implicit cost. In any case, who really ends up paying for the tax? The rakyat. A lot of anger has been directed towards these telcos, saying how they should be happy with what they have, and not burden the rakyat. Firstly, the tax is government imposed. The government is trying to shift the blame from themselves to the telcos. It’s like this: I make you pay, but I do so through another person. The other person then gets the blame for making you pay, and then I say how I’m such a great guy for helping you, and then get the money I made you pay in the end anyway. Now I do admit this is a rather simple illustration that does not take into account the uses of tax revenue (I will address that later), but in a nutshell, this is exactly what is happening! Secondly, I have illustrated how the rakyat still ends up paying for the tax one way or another. In one case, it is kept hidden; in the other, you know what you are paying for. Is it not better to at least be mindful of the real costs involved and be able to adjust one’s spending accordingly? Also, companies are ultimately made out of people. If I told you, you’re earning too much, you should absorb someone else’s taxes in addition to your own income tax and for Muslims, in addition to zakat, would you be willing to? I understand that perhaps there are cases of very kind people, but the majority would deem it unfair because you’re paying for other people from your own hard earned money! Thirdly, telcos also have a particular need for more money since it is a technologically based industry which is constantly developing and improving. We’ve had EDGE, 3G, 4G, god knows how many other Gs there are. Telcos need the money to expand, and relentlessly improve their services to consumers. Without that revenue to invest, their service will not improve and they will be far behind in terms of world competition. Do you want faster and better service, wider coverage? Then your telco needs profits – in the billions – to be able to provide all this expensive infrastructure and technology for you! Many have come up and defended the need for government revenue from taxes. Agreed, there is a need for income tax, but is there really a need for this prepaid tax, especially when many prepaid users come from the lower income bracket? The lower income bracket can benefit from this tax revenue if it is put to good, responsible, and efficient use – especially in the case of education programs to uplift the poor. However, I’d like to point out how this has been a consistent argument for high taxes, yet till today, 4 out of 5 of working Malaysians only have up to SPM education, while much of taxpayers’ money has been channeled towards mega projects such as Port Klang Free Zone (PKFZ). Simply put, it’s not that we don’t have enough tax revenue, it’s that it is not being utilised properly. It is my humble suggestion to abolish the prepaid tax altogether. Abolishing it would free telcos to lower prices to be more competitive (since now their cost is lower) thus benefiting all prepaid users. It would also potentially free up some income, especially for poorer groups where phone usage is a substantial part of their expenditure. This would allow them to use that saved money in a way that they would like to use it best, whether it be food, or education for their children; it would give them more control over their expenditure, rather than relying on state welfare programs where there is often inefficient administration. This would allow politicians to bring up two words that people love and not hate: NO TAX. All in all, I urge you: please think of the big picture before condemning telcos. Posted on 23 September 2011. You can follow any responses to this entry through the RSS 2.0. Read more articles posted by Ong Kar Jin. This is a scam officiated by a most profitable legally established company. It had scammed off more than billion based on our conservative estimation. The most regrettable part is that nobody (or authority) dares to probe or STOP the scam !! Would you believe, a public listed would scammed your money ? Your silent could have made them billion !!! Mr. Nabhan, I fear there is a slight misconception. The 6% is imposed on reloads and starter packs, not per minute charges. e.g. I used to pay RM10 for reload, not it'll be RM 10.60. But I still get my usual 15 cent a minute rate. But at any rate, we all still lose out when tax revenues are not used properly. Thank you for the comment sir. Im not a technical person, but i would like to give a piece of mind in regards how the users will loose. If the charge for i minute using the present case is at 15 cents per minute, and if i as Telsco, increase my per minute by 6 percent of the actual 15 cents per minute, then it would be increased by 15.90 cents per minute, who will be the looser? this will happen because the user will buy for RM 1o.00 token to reload and no-one is bothered to check the time his RM 10.00 reload will last. problem is people arent looking at the big picture. nice entry though. they way i see it, is how the telco set their rate so that they can absorb the 6% tax. what i see they keep on reducing their rate for the sake of getting more subscriber.